The Little Nell is a 5 star, 5 diamond resort. So, the accommodations and service are out of this world. Everyone we encountered from the concierge to room service was so helpful, friendly, polite, and treated us so well. I love their attention to detail – even down to turn down service! They left chocolate truffles on our nightstands and a fresh pitcher of water with two stemless wine glasses. The presentation of everything was just exquisite. 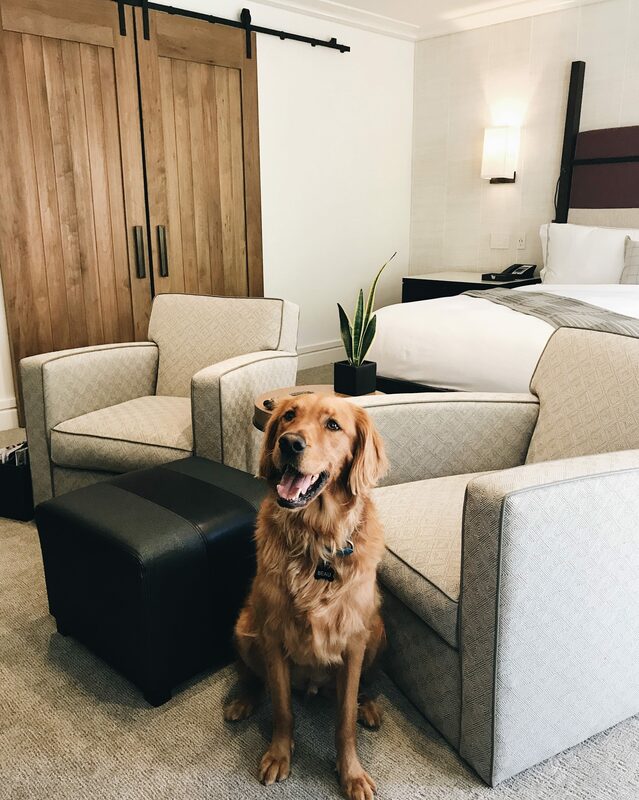 Our room at The Little Nell (you can see it pictured above in both pictures with Beau) was HUGE and absolutely beautiful! We had a fireplace in our room, flat screen TV, gorgeous bathroom with a huge tub, and of course…a beautiful view. I also loved that they have massive closets in the room with tons of hangers! I feel like hotels never have enough hangers in the closet haha. Also the robes they have in the room for guests are heavenly. I’ve gotta say…one of my favorite parts about The Little Nell is the incredible restaurants they have. Our first night we ate at Element 47 which is a 5-star restaurant, and a very fine dining experience. You guys…this was truly such a special experience. We had a sommelier recommend which bottle of wine we should get, based on what we were ordering and his suggestion was perfect. Probably the best white wine Michael and I have ever had. The food at Element 47 was just as incredible. I started with the summer vegetable salad which was SO fresh and hands down the best salad of my life. Even Michael loved it. And Michael started with the tomato curry bisque soup. For entrees, I got the salmon and Michael got the lobster! Both were amazing! We also enjoyed the breakfast buffet from Element 47 on our last morning. I’m typically not a fan of buffet food because they just seem mass produced and not fresh. THIS my friends, is not your usual buffet! They have an omelet station, the freshest fruit, and so many other delicious options! We were SO full after that buffet haha! We also ate at Ajax Tavern in The Little Nell for lunch one day! 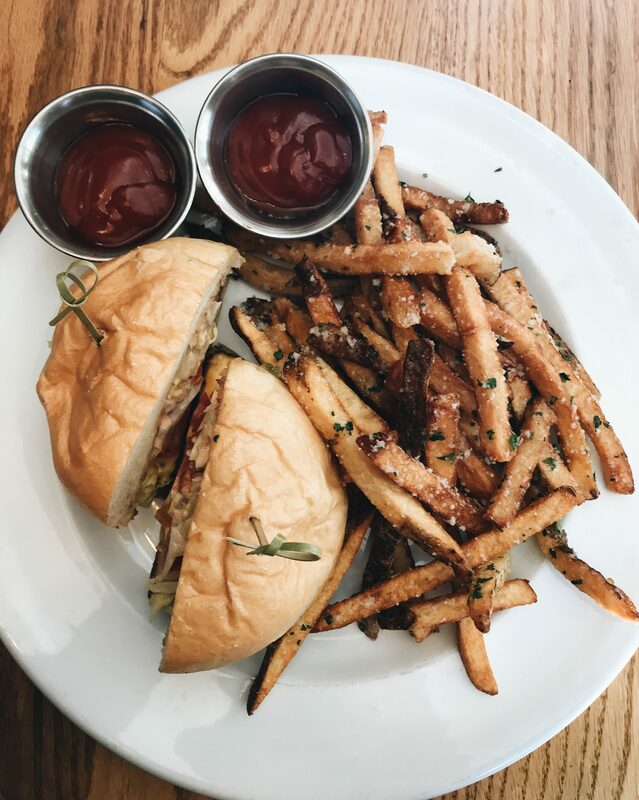 OH my word, you have to get the burger and truffle fries! You’ll thank me later. If you’re planning a trip to Aspen soon, we cannot recommend The Little Nell enough. It truly is such a special place. While it is absolutely luxurious, it’s also cozy and feels like home. We can’t wait to go back and visit in the winter! Here are a few of our favorite things to do in Aspen! Maroon Bells – if you come to Aspen, Maroon Bells is a MUST. Seriously one of the most beautiful places I’ve ever seen! You have to drive there, or take a shuttle. I want to stay it’s about 20ish minutes away? Once you get there, there are several hikes you can do (Crater Lake is a good one).. Or you can just hang out by the lake and have a picnic. It’s gorgeous. Cathedral Lake – Michael and I did Cathedral Lake Trail last week because it was recommended to us. It is GORGEOUS. I will say…it’s the first hike we’ve ever done that’s rated ‘hard’ and this hike is no joke haha. If you’re an experienced hiker or really in shape, you should definitely check it out. If not…maybe go for an easier hike! Ute trail – we haven’t done this one but I heard it’s gorgeous! Peach’s Corner Cafe – OH my gosh you have to go here for breakfast! It’s one of those restaurants where you order at the counter and then they bring it out, but the food is SO good! Everything is fresh and healthy and insanely yummy. We got there early because I’d heard the line can get pretty crazy (and it does). So if you don’t want to wait in line, I would recommend that. Oh! And get the “open face”. Trust me. 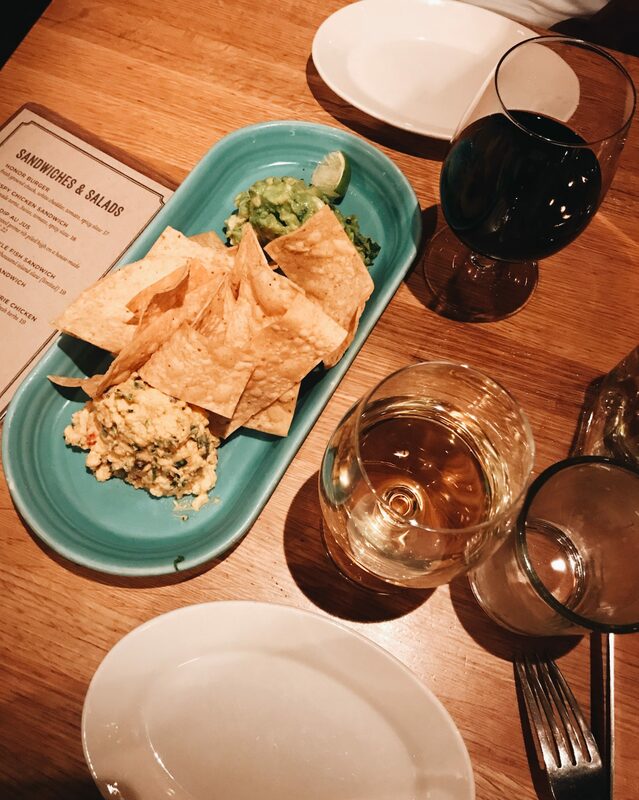 Meat & Cheese – we came here for dinner one night on our first trip to Aspen and LOVED it. Of course you can get amazing charcuterie boards, really good wine, and they have other boards as well for dinner! (We split the chicken board one night and got to pick sides to go with it). The food is so good and the inside of the restaurant is just darling. White House Tavern – (that’s where the picture above was taken!). White House Tavern is owned by Hillstone, who owns R&D Kitchen in Dallas, which y’all know I am OBSESSED with. White House Tavern is great for lunch or dinner. Their dip duo is amazing, and they have a really good chicken sandwich. We also love their ‘macho salad’ and I’ve heard the Thai Noodle Steak salad is so good. Grey Lady – we went to Grey Lady on our first trip to Aspen for dinner. It’s kind of pricy (but, fair warning…everything in Aspen is kind of pricy haha), but the food is so good and the atmosphere is really romantic! I got some type of fish when we were there in the summer and remember loving it. Aspen also has TONS of shopping – designer stores that we definitely don’t have in Boulder haha. So if you’re into shopping, you’ll love that part of Aspen. They also have the cutest farmer’s market that we went to on Saturday morning! There’s also a gondola right outside of The Little Nell that takes you to the top of the mountain and it’s absolutely beautiful! Wowza, that was alot of information! Hopefully if you’re planning a trip to Aspen though, this will help you out! 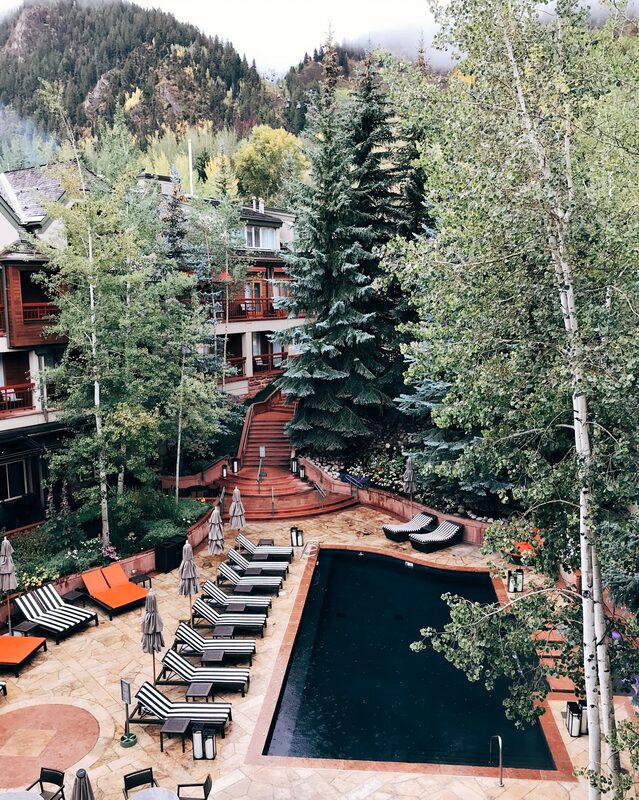 OR if you’re not currently planning a trip to Aspen…I hope this post convinced you!